Tine Vermeiran coordinates the Platform for Minors in Exile, based in Brussels, Belgium. The Platform for Minors in Exile is a member of the IDC, and in this piece she reflects on the research conducted by the IDC on alternatives to detention, and how it can be of use for national advocacy. What is The Platform for Minors in Exile? The Platform for Minors in Exile (Plate-forme Mineurs en Exil / Platform Kinderen op de Vlucht) is a Belgian platform of 50 organisations. The Platform coordinates the actions of professionals who work directly with unaccompanied minors and undocumented children in families. The Platform was established in 1999, upon the realization that, because of their legal, social and administrative situation, those foreign children could not fully benefit from their fundamental rights. Through coordination, the Platform advocates for better protection and social integration of those two vulnerable groups, mainly consisting of newcomers. The Platform aims at strengthening the expertise of its partners and the general public through research, awareness raising activities, the organization of trainings and study days. The Platform also works towards raising the awareness of the minors themselves about their rights. Finally, the Platform keeps track of the national and European legislative and institutional framework and formulates recommendations and proposals that guarantee the respect for the fundamental rights of the minor foreigners. What work has The Platform been undertaking? For several years, the Platform has been coordinating a working group on (alternatives to) detention of families with children. The working group brings together several members of the platform working on the topic of detention and its alternatives: civil society organisations that visit families with children in detention or in the ‘return houses’ (one of the alternatives to detention in Belgium), and/or that provide legal and psychosocial services to undocumented families, children rights organisations, the children rights commissioners and the ombudsman. During the monthly meetings of the working group, the professionals keep each other up to date regarding current practices, legislation and rules, as well as future plans. 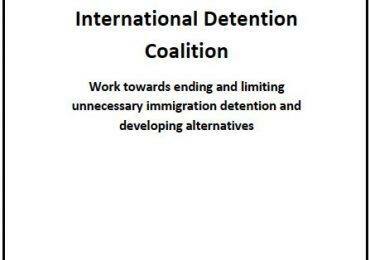 Jointly, the members of the working group set priorities for action, which can include advocacy targeting the authorities in charge (Immigration service, State secretary for Asylum and Migration), production of press releases or initiation of actions to raise awareness among the general public. 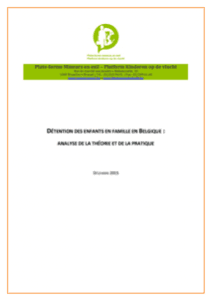 In 2015, the Platform Minors in Exile worked on a comprehensive report on detention of families with children in Belgium. 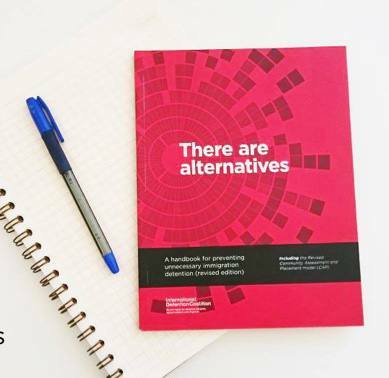 During the past months, the working group has been working to promote thereport and its recommendations among civil society organisations and with government representatives. 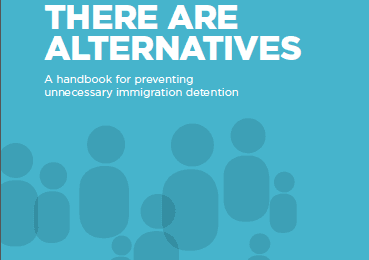 How has The Platform used the IDC research, There are Alternatives: A Handbook to Prevent Unnecessary Immigration Detention? 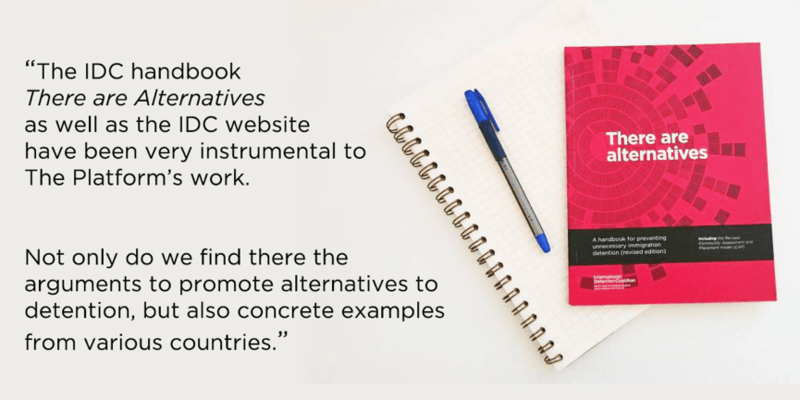 During advocacy meetings and talking about alternatives, the IDC handbook There are Alternatives as well as the IDC website have been very instrumental to The Platform’s work. Not only do we find there the arguments to promote alternatives to detention, but also concrete examples from various countries. Often discussions lead us to the topic of accompanying families towards durable solutions. There, we have referred to the IDC’s Community Assessment and Placement model (both in our discussions within the working group as well as with government officials). However, it was only after having received several presentations that I felt at ease to refer to this model. Indeed, the model is technical and not so easy to understand at first. When realizing that other members of our working group also had difficulties relating to the model, we decided to invite Eiri Ohtani of IDC to one of our working group meetings. The session was well appreciated by all the attendants and lead us to discuss the current situation and practices in Belgium. The model became now not only a theoretical framework to refer to, but also a tool to analyse the current practice in for example the ‘Return houses’. In addition to the presentation of the report and CAP model, we also had a presentation on the UK Family Return Panel, a practice that had been even the topic of a debate in the Belgian parliament. The explanation on this UK practice was thus timely and extremely relevant for the advocacy work of the Platform and its member organisations. What other ways IDC can support its members? As a member organization of the IDC, we value very much the IDC’s work. We however do like to stress that we experienced how important it is that the interesting and high-quality research documents and reports are accompanied by IDC staff members who present them. For us to be able to use the reports in our advocacy work at the national level, we need to feel at ease with them. This level of comprehension especially of theoretical models can only be obtained through presentations and direct exchanges with the IDC staff members, in addition to the reports. Eiri Ohtani, was the European Regional Coordinator at IDC who attended the Platform’s working group meeting and continued discussions about the findings of the IDC and how they could be of use to advocacy strategies in Belgium. Here she shares her insights. What are some of the challenges that you see when presenting IDCs research to members? 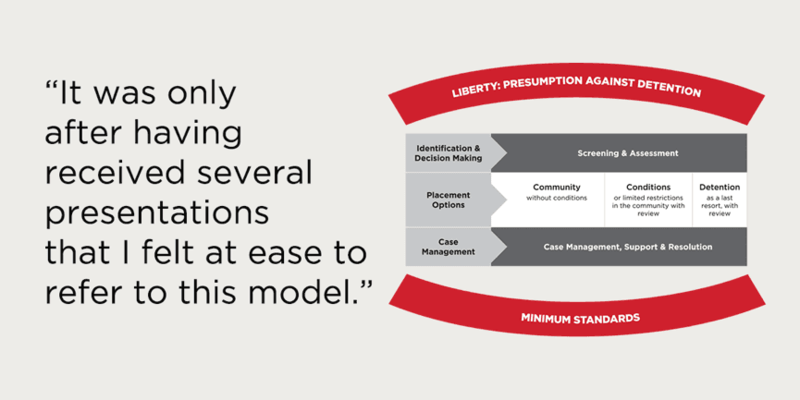 The IDC’s Community Assessment and Placement (CAP) model has been a useful tool to help stakeholders to begin conversations about alternatives to detention, while reviewing how detention is currently being used in their country’s migration governance system. 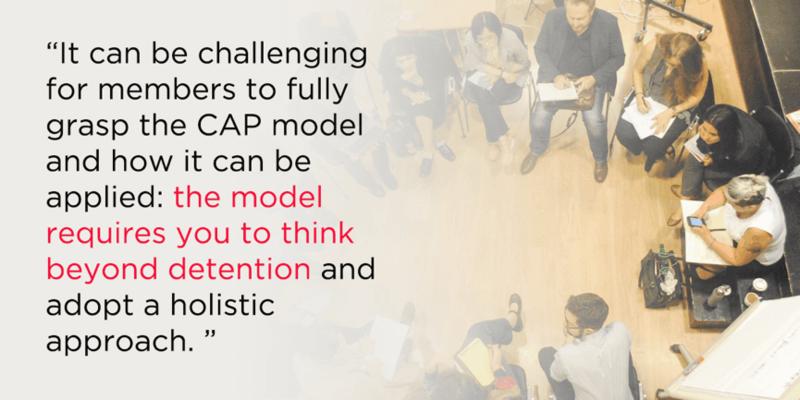 It can be challenging for members to fully grasp the CAP model and how it can be applied: the model requires you to think beyond detention and adopt a holistic approach. Face-to-face interactions are therefore helpful when delivering the CAP model: this enables us to respond to queries, ask series of questions to prompt members’ thought process, and ultimately, to help them come up with their own ideas about how change can happen. How do you see that the IDC research can be used in Belgium?